IndigoVision customers can now monitor their surveillance video on the move using iPads and iPhones. Mobile Center™, IndigoVision’s new mobile app, displays high quality video in real time. Mobile Center™ increases ease of access and usability for many of IndigoVision’s customers, who can now maintain visual contact with cameras from wherever they happen to be. Users still have access to PTZ controls, including presets, and can save and send video snapshots. Surveillance staff and management can keep in touch with what is happening across a site from their mobile devices, by accessing accurate information immediately without having to communicate back to a central control room. 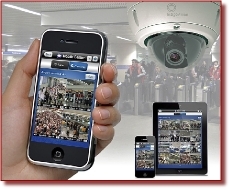 Mobile Center™ is an extension of IndigoVision’s successful SMS4TM Security Management Solution, allowing users to log on to their system and access all cameras anywhere, anytime. It is an incredibly easy-to-use app, with support for touch and swipe gestures, and allows instant use by any member of staff.